Google is a powerful search engine, but you may be missing out on it’s full potential. A great way to learn about the advanced search options is to visit Google’s Advanced Search page. You can fill in the field without having to know the operator. Once you’re familiar with them though, you can use operators from the main search. Here are five of the methods I use most that will give you even better search results. One tip before the rest of them is to think for a minute about the words you’re using. Google searches for text found on a web page, along with synonyms. You can get much better results by helping it out by adding a few more relevant keywords to clarify what you’re looking for. If you’re searching for a word phrase that has multiple contexts, not all of the results will be relevant to what you’re looking for. You can avoid this with the minus (-) operator. To use it, add a dash before any word(s) you don’t want in the search results. For example, if you’re searching for information about hornets (the wasp), you’re going to see results about the Charlotte Hornets too. To get rid of those results, add -charlotte to your search phrase, like so: hornets -charlotte. This will remove all search results that had charlotte in the text of the page. Sometimes instead of using the minus operator you can add a clarifying word to get better results. In this example, adding wasp or nest would make the search more relevant. But there are plenty of times where the minus operator can narrow down the search results to exactly what you’re looking for. I’ll often want to find an article I read on a particular web site. If you know the site you want to search, don’t search the whole internet. Add the site:[domain] operator and Google will only search the pages on that site. Your search will be far more precise. For example, if you wanted to read the article I wrote about Mailchimp on this site, you could use this search phrase: site:techmadeplain.com mailchimp. Sometimes you know the type of file you want to find. For instance, I often search for ebooks, which are often delivered as a PDF. In addition to searching for the title, you can add in the filetype:[extension] operator. The results will all be PDFs with tips on marketing. Here is a list of all of the supported filetypes. Whether you want to figure out how much 10 Euros are worth in US dollars or how many miles there are in 5 kilometers, Google makes it a breeze. Use the word in between the two phrases. For example, 10 euro in usd or 5 km in miles. This works with currency, weights, length and any other sort of measurement. It is really useful once you start using it. Lastly, when you have an exact phrase to search for, such as the title of a book, put quotes around the entire phrase. When you don’t have quotes, Google will search for all the words in any order and may even return results that doesn’t have one of the words in your search phrase. When you add quotes, the results will have those words in that particular order. For instance, search for wordpress plugins and compare the results with "wordpress plugins". 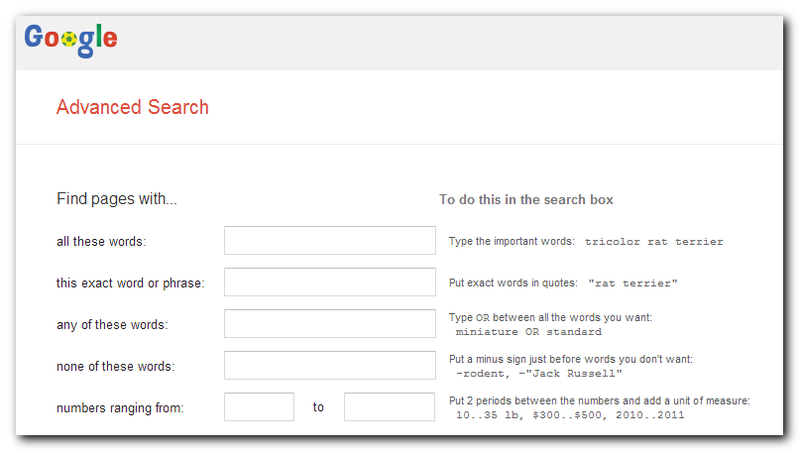 The first search will have pages that have either wordpress or plugins throughout the page. The second search will find pages with the phrase “wordpress plugins” together in the page. I don’t use this as much as some of the other tips, but I find it especially useful for book and song titles, or whenever you’re looking for an exact phrase.